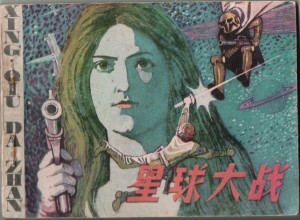 Home → Blog → A lianhuanhua version of Star Wars… from the 1980s! The actual lianhuanhua is a fascinating document, with weird bits sticking out here and there; but it’s also a fanciful imagining (I think) of American – or generalized Western – life, especially evident in the dinner scene where a duck (?) is being stuck into a toaster oven (!) & the table has not only a little hot plate, but a crockpot (or rice cooker) there, too. The artist also makes some amusing flubs – Chewbacca appears in some scenes in a relatively credible way, in others looking like an outtake from Planet of the Apes. It also often looks like something out of a Cold War-era propaganda poster, at least where the details are concerned. Were the actors really garbed in Soviet looking space suits? Was Darth Vader really pacing before a map bearing the location of the Kennedy Space Center? You can check out the rest of the post here.